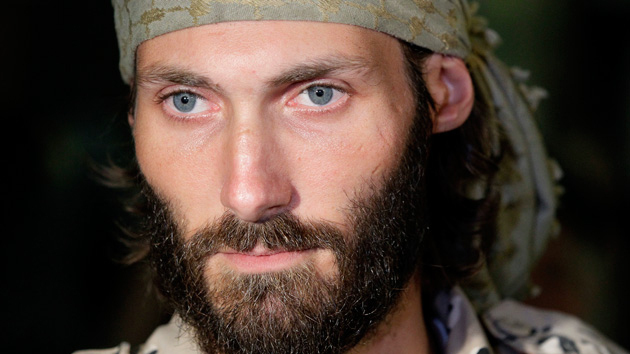 This Guy From Baltimore Is Raising a Christian Army to Fight ISIS…What Could Go Wrong? Meet self-proclaimed freedom fighter Matthew VanDyke. In late February, a Baltimore-born, self-proclaimed freedom fighter named Matthew VanDyke beamed into Greta Van Susteren’s Fox News show from Erbil, the capital of Iraq’s Kurdish region. A few days earlier, he had announced on Facebook that he was in Iraq to “raise and train a Christian army to fight” ISIS and that he had formed a company called Sons of Liberty International (SOLI) to provide “free military consulting and training to local forces fighting terrorists and oppressive regimes.” For months, the so-called Islamic State had terrorized Iraq’s Assyrian Christians, forcing many to flee their homes and villages and seek safe haven among the Kurds. With ISIS on the march across Iraq and Syria—and making headlines for its brutal beheadings of journalists and aid workers—the story of an American taking an on-the-ground role in the fight sparked a media frenzy. VanDyke, who is 35 and holds a master’s degree in security studies from Georgetown, was soon featured by media outlets across the country, including the New York Times, USA Today, the Baltimore Sun, and MSNBC. This wasn’t the first time VanDyke had become a media sensation. A few years earlier VanDyke had made international headlines after he was captured in Libya, where he had been fighting alongside rebel forces to overturn the regime of Moammar Qaddafi. He eventually escaped, and he would later say that his Christian faith deepened during his six-month imprisonment. A film about VanDyke, who had traveled across the Arab world by motorcycle, won best documentary at the Tribeca Film Festival in 2014. But as VanDyke solicited donations, his operation was in trouble. By the end of February, the military director of the Iraqi Christian militia VanDyke’s company was training would issue a press release formally severing the group’s ties with the American (though he would later rekindle his relationship with VanDyke and SOLI). Meanwhile, the initial crop of US military veterans VanDyke had brought to Iraq as trainers had abruptly quit*, citing concerns that VanDyke may not have obtained US government authorization to provide military training to foreign nationals, as required by US law. Flouting such rules can carry massive fines—even prison time. Last summer, ISIS began targeting the Assyrians of northern Iraq, one of the oldest Christian communities in the world. Militants massacred civilians, blew up ancient artifacts, and bulldozed settlements, including the 3,000-year-old city of Nimrud. Horrified by the slaughter—and by the beheadings of journalists Steven Sotloff and James Foley, both of whom VanDyke knew—he began contacting Iraqi Christian political leaders and offering his services to train a militia to repel the Islamic State from their territory. VanDyke wasn’t the only one with this idea. A California-based nonprofit group called the American Mesopotamian Organization had undertaken a similar effort, dubbed “Restore Nineveh Now,” to help the Assyrians defend themselves. Both VanDyke and the AMO would separately begin working with an upstart militia group that eventually dubbed itself the Nineveh Plain Protection Units (NPU). After securing the backing of some local leaders, VanDyke, who has no formal military training, began recruiting US military veterans to forge the NPU into a well-disciplined fighting force. One of his first calls was to Michael Cunningham, a retired Army sergeant who was featured in Restrepo, Sebastian Junger’s 2010 documentary about the fierce fighting in Afghanistan’s Korengal valley. VanDyke and Cunningham had met at a film festival, where Marshall Curry’s documentary on VanDyke, Point and Shoot, was screened alongside Restrepo. When VanDyke entered the picture, the NPU decided to work with both him and the AMO. VanDyke’s arrival on the scene caught the AMO off guard. “I did not know that he existed,” says David Lazar, the AMO’s founder. “I had never heard of him.” Lazar asked Gardner to keep tabs on VanDyke and check his background. SOLI’s training program was “secret,” VanDyke says, “and it actually remained that way for December, January, and February.” He says it was important to keep the program under wraps for safety reasons, since the Islamic State’s stronghold in Mosul was less than 25 miles away from its training camp. According to VanDyke, he ultimately revealed the existence of the training effort—though not the location of where it was happening—because he was running out of money and needed to solicit funds to keep the project going. But a State Department official says, “We have checked with State Department personnel at our Consulate in Erbil and they have conveyed no such” approval of VanDyke’s training program. In interviews with Mother Jones, VanDyke repeatedly said the State Department was initially unaware of his training efforts. He subsequently stated in an email that “Sons of Liberty International complied with US registration requirements prior to signing a contract with the Nineveh Plain Protection Units (NPU), as required by U.S. law.” The State Department’s Directorate of Defense Trade Controls—with which all US-based military and security firms planning to provide services overseas must register—does not make public its registrants. But according to that office, approved registrants receive a certification form that they are free to share. VanDyke did not respond to a request to provide this documentation. In the past, the Justice Department has aggressively prosecuted military contractors who violate the Export and Control Act. One high-profile case involved the infamous military contractor Blackwater, which in 2010 was forced to pay the US government $42 million for violations that included offering “defense services” to the government of the Sudan “without first having obtained a license from the US Department of State,” according to an FBI press release on the settlement. As part of this case, Blackwater was charged with illegally providing training to Canadian law enforcement and military personnel. Soon after Christmas in 2014, the initial group of 25 NPU recruits graduated from SOLI’s training program, and VanDyke returned to the United States to fundraise. Cunningham stayed behind to train the next class of recruits. 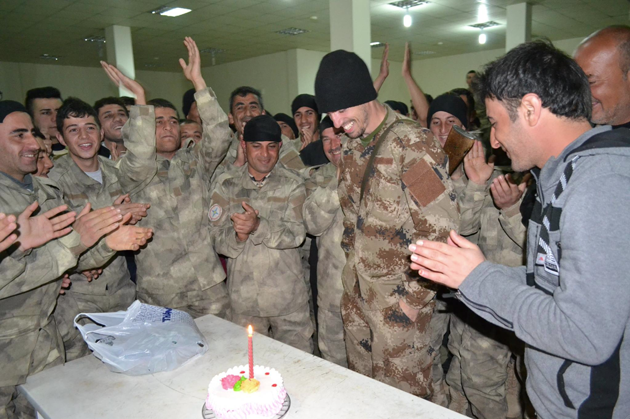 The NPU had received hundreds of applications from Iraqi Christians eager to receive military training, and it chose 350 to participate in the next session. To accommodate this larger class, the Kurds gave VanDyke use of a former US base known as the Manila Training Center. In late January, the American Mesopotamian Organization’s Gardner visited Iraq to check on the NPU’s progress. He was also curious to find out more about VanDyke. When Gardner visited the Manila Training Center, VanDyke was still in the United States. But Gardner did meet Cunningham and the other SOLI trainers, who unloaded on VanDyke. “They told me, ‘We cannot work with this guy,'” Gardner recalls. The trainers complained that VanDyke’s operation was disorganized, unprofessional—and possibly illegal. Based on Gardner’s conversations with the trainers and others at the training camp, the AMO urged the NPU to cut its ties with VanDyke. The militia’s leaders agreed to do so after SOLI’s second training program ended in early February, according to Gardner. In an email interview, Zaya said that he was surprised and aggravated by VanDyke’s media blitz. Though he was satisfied with SOLI’s work at the training camp, Zaya noted, he believed that VanDyke was inflating his role with the NPU. “He was appearing in the media and spoke like he [was] our savior,” Zaya wrote. 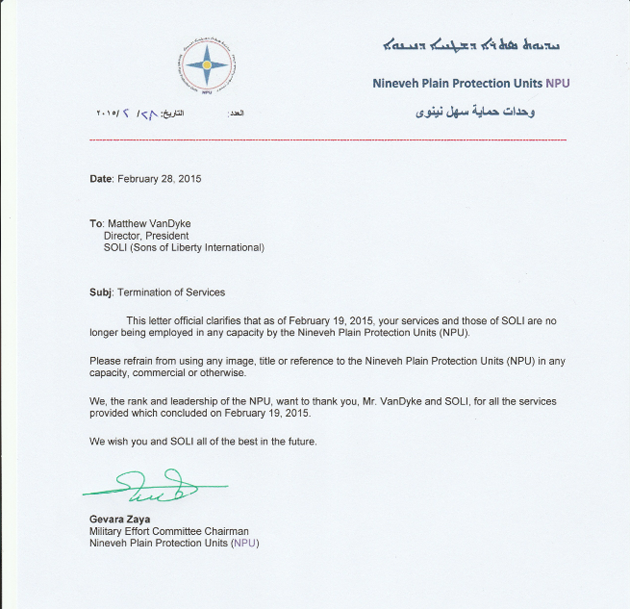 A few weeks later, in late April, Zaya sent a text message to Mother Jones to say that he wanted to revise his earlier comments about VanDyke: “While we were glad to have Matthew speak good about us…Matthew and us do not want people to think…he was a leader of NPU. [The] press release [was] to make clear that he is not a leader of NPU.” Contrary to the NPU’s press release and his letter to VanDyke, Zaya now said the NPU had never cut ties with VanDyke and that the NPU was considering a new training proposal from SOLI. 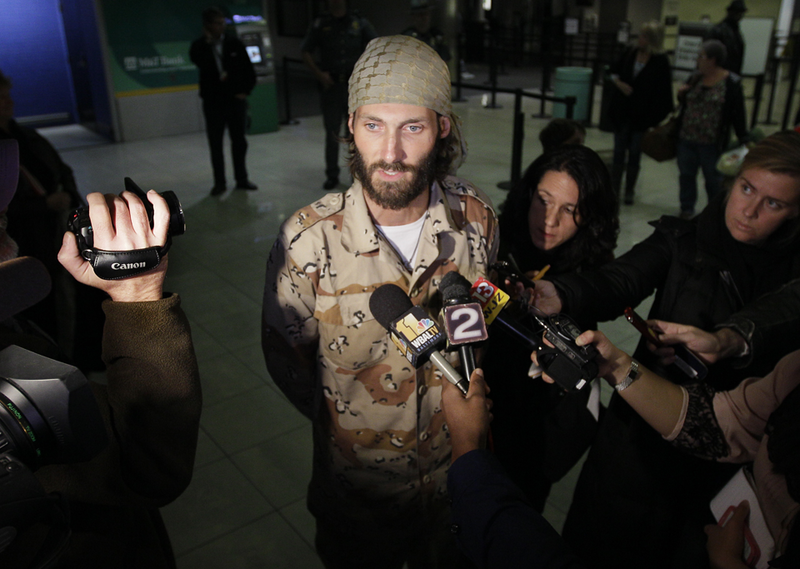 Undeterred, VanDyke was meeting with other Christian forces in Iraq to pitch his services, according to the release. “SOLI looks forward to its next mission to support the Christian community of Iraq in their fight against ISIS,” he said. Clarification: According to VanDyke, there was a fifth trainer who left the program on good terms. Correction: A previous version of this article inaccurately said that VanDyke reported that the ADM’s ban had been directed at SOLI.